Heather is a 1994 graduate of the Rhode Island School of Design with a degree in illustration. She has also continued to study painting at the Pennsylvania Academy of the Fine Arts and the Wayne Art Center. 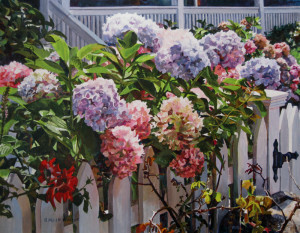 She paints primarily in acrylics and continues to find colorful inspiration among the beautiful landscapes of Pennsylvania, coastal Maine and beyond. She was chosen to be the 1999 Holiday Card Artist for the local chapter of the American Cancer Society, and the 2000 and 2003 Devon Horse Show and Country Fair poster artist. She has been in numerous regional and local art shows, and is affiliated with various galleries in the area.